The Browns Park National Wildlife Refuge, located about 90 miles west of Craig, features elk, deer, moose and other wildlife in an area noted in Wild West history as home to ranchers, rustlers, fur trappers, outlaws and Fort Davy Crockett. The 13,455-acre refuge, administered by the U.S. Fish and Wildlife Service, also is home to river otter, beaver, black-tailed jackrabbits, osprey, Great Basin gopher snakes, songbirds, Woodhouse’s toad and waterfowl. There are 200 species of birds. 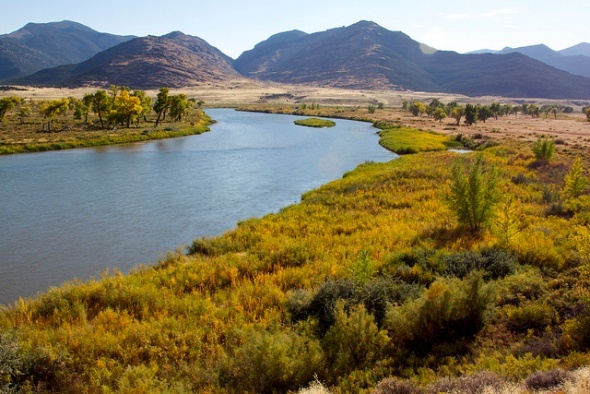 The refuge is located in Browns Park, a valley set between Diamond and Cold Springs mountains that stretches from northwestern Colorado into northeastern Utah and southwestern Wyoming. It also is known as Browns Hole. Native Americans were living in the valley as early as 1500 B.C., and fur trappers visited the area as early as 1824. Fort Davy Crockett was built by fur traders in 1837 where the Vermillion Creek feeds into the Green River to serve as a post for trading with Native American tribes and to protect against raids by the Blackfoot tribe. The fort was named for the frontiersman and congressman after his death in the 1836 battle of the Alamo. The one-story fort had log walls, a dirt floor and a dirt-covered roof and was nicknamed Fort Misery for its poor living conditions. It was abandoned in 1840, after a sharp decline in fur trapping. Capt. John C. Fremont camped at the site during a trip to California in 1844 and reported that little was left standing. Ranchers followed the fur trappers into the remote mountain valley, along with outlaws, including Butch Cassidy’s Wild Bunch, Isom Dart and Tom Horn. Explorer John Wesley Powell passed through the area in 1869 and coined the name Browns Park for the valley. The Two-Bar Ranch, which is located in the refuge, became the headquarters for one of the largest cattle empires in Colorado and Wyoming, with more than 10,000 head of cattle in Moffat County alone in the early 1900s. The main ranchhouse and bunkhouse, a blacksmith shop and two other buildings, two log dugouts, two log barns, a log privy and log corrals are badly deteriorated but still standing, and the ranch is listed on the National Register of Historic Places. The buildings are believed to date back to the late 1800s and reportedly include logs salvaged from Fort Davy Crockett. Refuge officials determined that the buildings are too deteriorated to restore and have left them to the forces of nature. Also listed on the National Register of Historic Places is the Lohore School, which was built in 1911 on a bench overlooking the Green River that was donated by the Hoy ranching family. The school, which measures 30 by 50 feet, served children from Colorado, Utah and Wyoming from 1911 to 1947. The building was used for dances as early as 1912 and became a community center in 1954. Archaeological studies show that prehistoric people lived in Browns Park as long as 8,000-10,000 years ago, likely to hunt elk and deer, and prehistoric farmers were growing corn in the valley about 3,500 years ago. The refuge’s eight-mile River’s Edge Wildlife Drive passes along the Green River and through a variety of wetlands habitats for wildlife viewing. The entrance to the refuge is a mile east of the Utah border on Colorado 318.